Welcome to Day 3 of the Consequences Audio Tour! 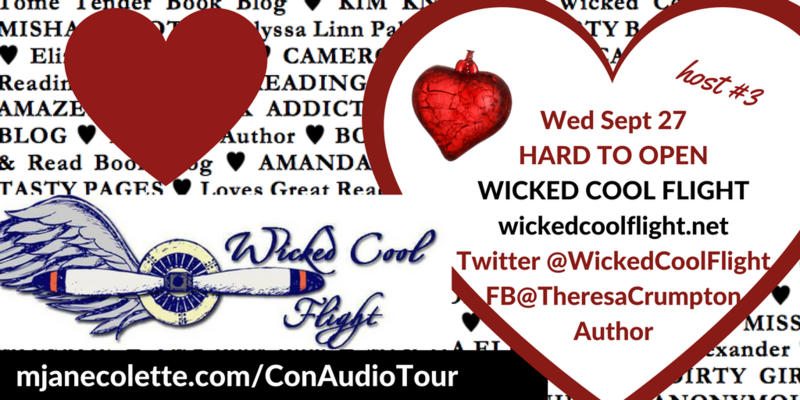 If you’re in a hurry to listen to Chapter 3: HARD TO OPEN, run to WICKED COOL FLIGHT BLOG RIGHT NOW! Me: That’s where you get to… look, stop wasting time! Run run RUN to WICKED COOL FLIGHT BLOG to find out! The Wicked Cool Flight crew, which includes author Teresa Crumpton, Fly Girl, and NICUNurse, was at RT 17 in Atlanta, Georgia… and I didn’t get to meet a single one of them! But I followed up with them afterwards, and Wicked Cool Flight was generous enough to do a wicked profile on me as part of the Cherry Pie Cure launch in which I got to pontificate about why I write for, like, grown up women (it has a little to do with when and how women hit their sexual peak and… my own age… and what not) and I’m so thrilled they accepted the invitation to be part of the Consequences Audio Tour, and that they are hosting the “Hard To Open” chapter! Thank you, Teresa Crumpton & Wicked Cool Flight! Great chapter luv Looking forward to my day. xoxoxoxo me too! I’m so excited about this entire project, and I’m so so thrilled you’re in the cast!